Walking to the grocery store, the wind is bitter and nipping. I shove my hands deep into the pockets of my winter coat, seeking warmth. But instead, I find something cold and calculating, and pull it out to see what it is. Scowling and angry, he's been lying in wait. I'm pretty sure this is an omen. A very bad omen. An omen that the prices inside the grocery store are going to make me sick to my stomach. Ah well, he's not nearly so threatening without his mask anyhow. Perhaps the mask is looming in wait in my medicine cabinet. 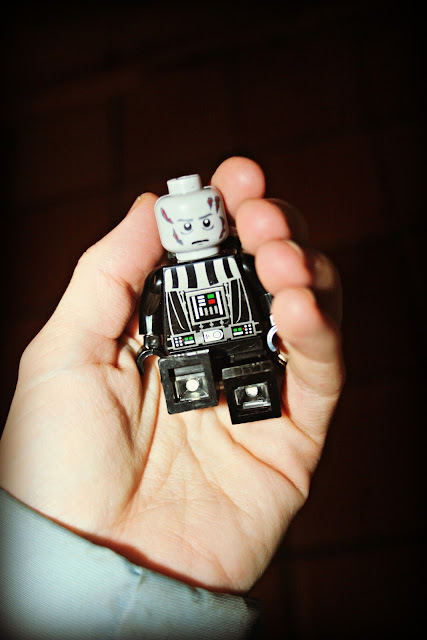 In the meantime, at least I have a flashlight if I need one (Darth's feet light up). Hey readers, found anything skulking in your pockets lately? Yes, I have found something in my coat pocket of late....a soggy, half-eaten, doggie treat. That is too funny and kind of cute. It's fun being a boy mom, isn't it? I find random leaves and rocks in mine. I love this and going to the grocery store these days makes me sick too. That was funny!! A lovely and unexpected effect of having kids around! Sadly it goes by too fast!! Thanks for the morning smile!!! Maybe he will light your way to good deals. Haha- I always find random things in my pockets. THe joys of having kids,lol! I often find an egg that I've gathered the day before and forgot to put in the fridge. Doh! This is so cute! I don't find anything fun like this in my pockets. I'm lucky if I find some loose change I forgot about. I always used to leave change in my pockets of my winter coats so when I go to wear them the following year I'd find it! lol I don't like carrying change around now so I don't do that in my pockets but will leave it in my purse when I switch them around. That's a cool Lego man! Jarod doesn't have him because I didn't know they had ones whose feet light up! Wonder what his feet lit up deep in your pocket? I was at the grocery store yesterday and YOWZA! Feeding boys is expensive. Maybe Darth can direct some of that evil energy towards those sickening prices! I agree, they are terrible! Our horse likes peppermints so I find them melted in my pockets. Gave him a green one yesterday and he spit it out and made faces at me. A real clown. Julia has been leaving me "treats" everywhere. Recently, I found a barbie in my purse! I just love your wry humor, off beat thoughts, and style of writing. Coming back is like a refreshing drink. You make me think of things I would not, and you make me laugh! This is one of the best pocket finds ever, I bet the boys will love it, will they remember it? Usually I find lists in my pockets, I have to write them for everything, also wipes, which I carry most times. Nothing near as cool as this. An egg I forgot to remove when I came in from the barn. Yuck. I just found a hole in my coat pocket. My keys dropped straight through to the ground below!!! All I ever find are those weird smashy bits of fabric or lint or heck what are those made of? My trip to the grocery on Saturday made me feel quite ill. Seriously. I like the fact that Darth's feet light up. My son doesn't have small toys like this anymore. Kind of makes me sad. Hope that little 'omen' didn't bring you bad news at the store. How funny! I love reaching in the pockets of my jackets at the beginning of winter and finding what I left there months before. Usually old lists or dog biscuits. Well, I think I'd rather find a $5 bill instead of a scary guy! my mommy finds nails and doggy treats in her pockets. All I found in my pocket was a dirty kleenex. I hear you about the prices of groceries. Yeah, the price of groceries seems to be out of control as of late. I am glad I no longer have a family to feed. Ha ha! At least one of your sons gets his toy back. Once I had an extra pair of undies that were Isaak's. I had them in my pocket because he was potty training. He rarely wet, so instead of grabbing a diaper bag I grabbed a pair of his underwear. I have definitely found those little Lego guys in my pockets before. Today it was pretzel and goldfish crumbs and the empty bags they were in! Cute post! I tend to find plastic bags in my pockets because I always stuff 3 of them in there when we walk the dogs. It's been a long time since I've had a toy in my pocket. I did find a LA Museum ticket in my pocket on Tuesday. As a matter of fact, I found a handful of junk left over from last year in a jacket pocket. Contents: old used tissue (ewwww) sticky old cough drops, receipt from Dollar Store, pennies and a paperclip. I usually find hair barretts from the girls and some little toy from gum machines that my grandsons leave in my car. Those grocery store prices sure make me sick. I try to stay away and send my husband. He is much better at sticking to my shopping list than I am.